The Madrid-Barcelona air shuttle remained the most frequent route of the EU in 2010 but lost 15.9% of passengers over the previous year due to competition from the AVE high speed train and the economic crisis, according to figures released yesterday by the statistical office Eurostat. Malaga airport Terminal 3 figures in the 27th position of European terminals and within the ‘top 30’ of the facilities of the EU with more passenger traffic, concretely with more than twelve million tourists. Madrid-Barajas remains the fourth largest airport in the European Union in terms of passengers and is the most popular regarding domestic flights. 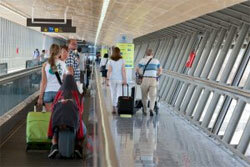 Barcelona-El Prat is situated in ninth place in the EU. Behind the air link Madrid-Barcelona is situated the route London Heathrow-New York (JFK).